Budget airline Ryanair says it has made a "non-binding offer" for loss-making Italian carrier Alitalia. In May, Alitalia filed to be put into special administration for the second time since 2008. It will now be restructured, sold off or wound up. 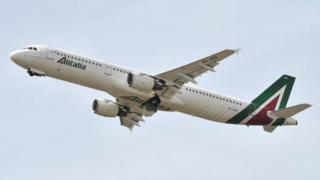 On Friday, Italian media reports said Alitalia had received about 10 non-binding offers. "We are serious in indicating we have an interest in Alitalia," said Ryanair chief executive Michael O'Leary. He added: "But we are also serious in that our interest in Alitalia is only... if there was a significant restructuring so that Alitalia could reasonably be seen to operate on a profitable basis." Mr O'Leary also said there would need to be "an absence of Italian government interference". The Italian government has ruled out renationalising Alitalia, which was privatised and relaunched nine years ago after filing for bankruptcy in 2007. The government said in May that it would provide a bridging loan to keep the airline's planes flying for about another six months. About 18 firms initially interested in a potential purchase were reportedly given access to Alitalia's financial figures, and non-binding offers had to be submitted by the end of last week. Those interested in making binding offers have until October to do so. However, if no buyer comes forward then administrators will be faced with the prospect of winding up Alitalia, which is 49%-owned by Gulf airline Etihad.